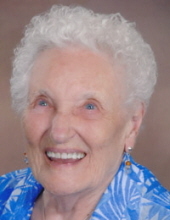 ALEXANDRIA, IN- Marjory “Marge” Jeannette (Staudacher) Poole Ray, 100, Alexandria went to laugh with the angels on Thursday, April 11, 2019. She was born May 9, 1918 to Walter and Katherine (Feineaur) Staudacher in Bay City, Michigan. She graduated from Handy High School and received a degree from the General Motors Institute as a Comptometer operator. Marjory was a Michigan Women’s Division Champion Archer and hunted alongside famed archer Fred Bear. She was a member and served as President of the Alexandria Art Circle, Aesop Club, Federated Women, Tri Kappa, and the Alexandria Library Board. Marjory was a Neighborhood Chairman for the Girl Scouts as well as a Cub Scout Leader. She was the first woman in Indiana to obtain a Real Estate Brokers license. She was also a licensed Insurance Agent. Marjory enjoyed her years as Editor of the Alexandria Times Tribune. In addition, she ran for several political posts during her years as a resident of Alexandria. CHILDREN – Roger Poole of Montgomery, AL, Joyce Lait of Louisville, KY, Penny (George) Stewart of Marion IN and Suzanne (Joe) Remington of Alexandria. GRANDDAUGHTERS – Susan (Chuck) Gambrell of Pike Road, AL, Sherri (Ryan) Davidson of Wetumpka, AL, Marcie George (Shawn Everitt) of Alexandria, and Ande Remington (Donnie Martin) of Alexandria. GREAT-GRANDCHILDREN – Jasmine George (Paul Stanley) and Eric George, both of Raleigh NC, Lee Ellis (Kenzie Corya) of Muncie and Trever Harpel of Elwood. SISTERS-IN-LAW – Lee and Mary Jane Staudacher. She was preceded in death by her parents, her first husband, Myron C. Poole, in 1967 and her second husband, Murl Ray, in 2006. Services honoring Marge’s life, faith and legacy will take place at 2 pm on Saturday, April 13, 2019 in the Lutheran Church of Our Blessed Savior, 309 West Washington Street, Alexandria with Pastor Kal Rissman officiating. Private interment will follow in Park View Cemetery, Alexandria. Friends may call at the Owens Funeral Home, 412 North Harrison Street, Alexandria on Friday from 5 pm to 7 pm, or at the church on Saturday after 1 pm prior to the services. Memorial contributions are suggested to Pete’s Pantry, with envelopes available at the visitation and services or the charity of the donor’s choice. To send flowers or a remembrance gift to the family of Marjory Jeannette Poole Ray, please visit our Tribute Store. "Email Address" would like to share the life celebration of Marjory Jeannette Poole Ray. Click on the "link" to go to share a favorite memory or leave a condolence message for the family.